Where Do I Find Colored Bottles for My Bottle Tree? We hope you like this selection of colored bottles for bottle trees! Your beautiful garden creation has unlimited creative potential. Combining different sized bottles, different shapes and different colors are part of the fun. When designing your wine bottle tree, the general rule is “There are no rules.” Have fun with your bottle tree creations with your new supply of colored bottles. It is said that the original intent of Bottle Trees was to trap bad spirits. Bottle trees reportedly first arrived in American by way of the African slave trade. As a result, bottle trees first became popular in the South. Hundreds of years later, the creation of Bottle Trees are now a popular art form. These beer and wine bottle trees are now being displayed at garden shows, craft fairs and farmers markets. Garden writer and photographer Felder Rushing has encountered thousands of bottle trees and other forms of glass garden art in his travels. In his book BOTTLE TREES he presents 60 of his favorite bottle tree art creations, from the backyards of Mississippi to the Chelsea Flower Show to the glass fantasies of Dale Chihuly. With humor and affection he tells the stories behind the photographs: the history and lore of bottle trees and glass sculpture, and the inspired people who make them. I purchased this book through Amazon. It is such a beautiful book. I enjoyed reading all of the stories of Mr. Felder’s journey through many gardens. Bottle Trees have a very long history and he makes you feel like you are present in each garden. What magnificent art! It makes you want to run out and start your very own tree. So many ways to express yourself in this “whimsical art of garden glass”. I hope this is just the beginning of many books to come of his journeys of bottle trees. Whether it is your first time thinking about a bottle tree or if you are a seasoned bottle tree expert, this book is a must have. You’ll be inspired by the dazzling photographs as well as the fascinating folklore about bottle trees. 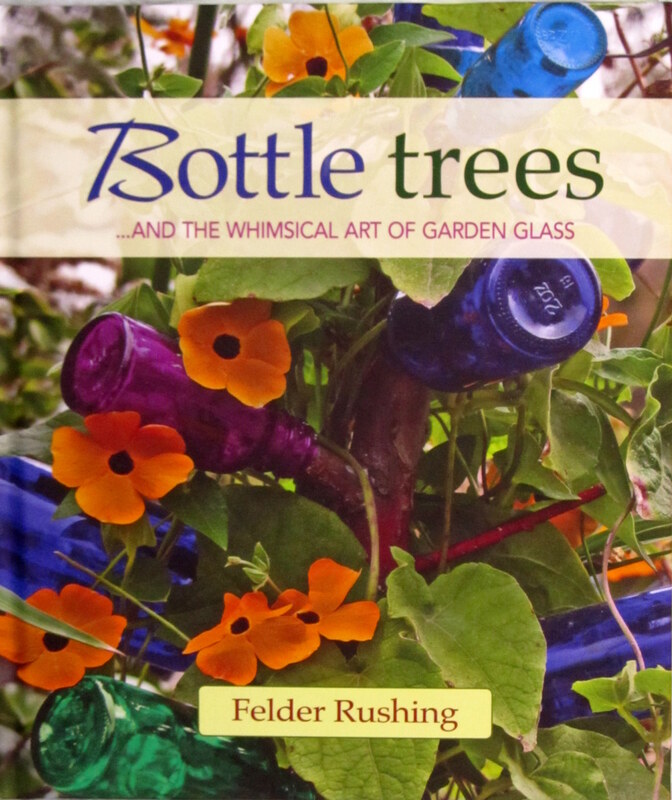 Simplistic in his approach, Felder provides a tour through the bottle tree universe with full color photos of some of the most interesting bottle trees with fun and simple commentary. 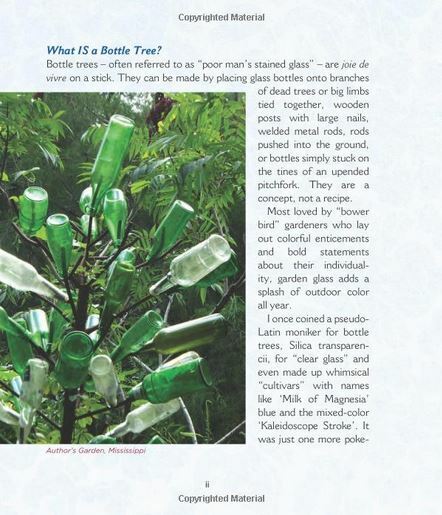 It also makes an interesting coffee table book for your garden gazebo, sun room, or any eco friendly business as it provides inspiration on how to turn your waste colored bottles into beautiful bottle tree art. Whether you gather them slowly, or just jump in and purchase colored bottles for your bottle trees, this book will definitely inspire you!